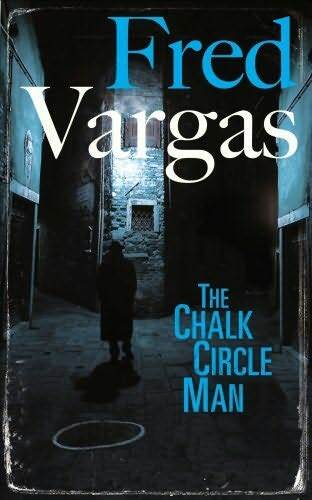 THE CHALK CIRCLE MAN is the very welcome first novel of Vargas' Jean-Baptiste Adamsberg series, the eccentric French series featuring an eccentric French policeman who investigates by intuition and instinct, and arrests people against logic. And always gets his man. Mysterious chalk circles have started to appear on the streets of Paris. Drawn overnight, they contain increasingly bizarre objects: a pigeon's foot, cigarette lighters, a hat, a doll's head. Are they there to draw attention to discarded rubbish? Or does the artist put the items inside the circles? Is it for amusement, or is it for something more sinister? Adamsberg tends towards the latter option, and, being the man he is, keeps a close eye on the newspaper reports, which treat the circles as a silly practical joke. That is, they do until something far more sinister turns up in one of the blue circles: the body of a woman with her throat cut. Adamsberg's instincts are proved right, and he begins digging into the case in earnest. But his crucial question is: is the blue chalk circle man the killer, or is the killer a clever opportunist who has spotted a great moment to muddy some waters? By now, anyone familiar with Vargas' work will not be remotely surprised by such a quirky synopsis, and, indeed, would probably be delighted to read something so seemingly bizarre! And I don't think they'd be disappointed, because the first Adamsberg novel is a perfect example of Vargas' fiction. It's the shortest of her works so far, the most succinct, the one most unclouded by subplots: Vargas takes her odd starting point by the scruff of the neck and turns it into the most streamlined and straightforward of her novels so far. There are great pleasures to be had in the length and depth of the later novels, the greater complexities of the plots, but that doesn't detract from what is a perfect introduction to the Adamsberg series, an introduction that focuses on the very aspects of her writing that people seem to like: the sheer innovative nature of her bizarre plots, and the fascinating character of the protagonist himself, a dreamy, intelligent, disorganised detective who has scant regard for concrete clues and steers cases based on his own sometimes inexplicable hunches. THE CHALK CIRCLE MAN is direct, focused, funny and is a kind of condensed Vargas primer. An ideal place to start, really, as befits the first novel in a series! There are some other superb eccentrics as well, namely the marine biologist and the blind man, both as forthright as each other, who forge an unlikely friendship and hold crucial clues for Adamsberg's investigation. It's no chore at all to spend portions of time away from Adamsberg and with these two other oddballs instead. Vargas' novels have a specific kind of appeal: they are, of course, superbly constructed puzzles, but above all they're wholly original crime novels with a different kind of outlook on the form: they're a bit bonkers, a bit maddening, a lot gripping, and vastly entertaining. They're not for people who demand gritty realism from their crime fiction, but as exercises in the flightful pleasure of reading a crime novel written from a slightly different angle, they are the absolute best you can find. This is a superb first entry in the Adamsberg series. Read another review of THE CHALK CIRCLE MAN.